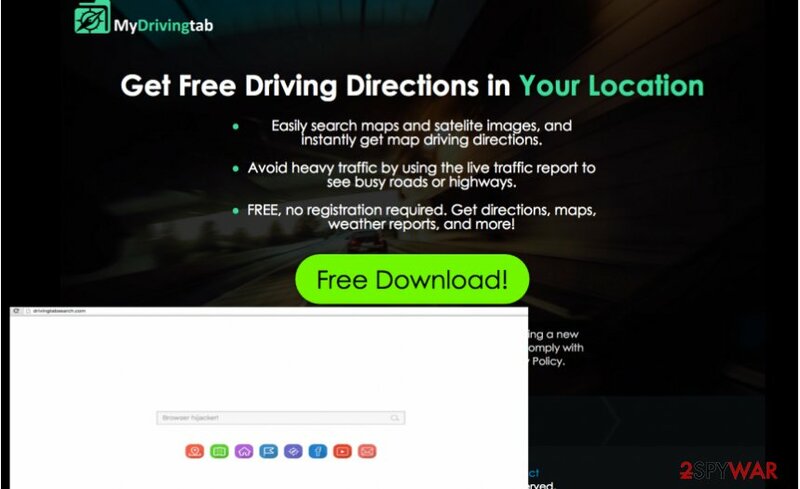 MyDrivingTab is the PUP that uses misleading techniques to prevent removal. Use Reimage to locate malicious components and get rid of them faster than with uninstall instructions. A full system scan blocks virus reappearance and prevents traffic to malicious domains. Should you remove MyDrivingTab virus? How did this program succeed to hijack your computer without your knowledge? How to remove MyDrivingTab from the PC? MyDrivingTab redirect virus is a potentially unwanted program (PUP) that represents DrivingTabSearch.com search engine. At the first sight, it seems that this program is a useful tool that can help you find driving directions in the city that you are currently in, avoid heavy traffic and ease your way to your destination. Sadly, the real aim of this program is entirely different, and it functions just like any other browser hijacker. Once installed, it changes the homepage to DrivingTabSearch.com, sets the same URL as default new tab page and search engine as well. Do not be fooled by the safe-looking appearance of DrivingTabSearch site; in reality, it is a highly suspicious search engine that delivers altered search results each time the user attempts to use it. This search tool is designed to reroute users to predetermined Internet sites instead of opening websites that are related to search results. The only reason why this site causes so-called MyDrivingTab redirects is pay-per-click revenue, which is what interests the developers of this shady application. To sum up, by installing this over-praised program you will only agree to change your browser’s settings and add a “Driving” extension, which will monitor your activity the entire time as you browse the Internet. MyDrivingTab browser hijacker gathers particular data about the user who installs it. First of all, it finds out what is the IP address of the victim’s computer, what websites does the user visit, how much time he/she spends on them, what ads have lured the user to click on them, and what search terms the user has used in his/hers web searches. Think whether you want to reveal such information to some questionable company, which is most likely going to share these details with third-parties to deliver “relevant” advertisements to you. These ads can appear in Driving Search results, pop-up in new tabs or windows, or just be injected into random text lines on the websites that you will be visiting. If you are not willing to explore some questionable third-party websites, then we suggest staying away from these ads. What is more, the activity of this hijacker can significantly slow down the performance of your web browser. To sum up, it seems that this program can only cause various problems rather than provide beneficial features. Therefore, you should consider the idea of removing this hijacker from your PC. To remove MyDrivingTab, use Reimage or a similar anti-spyware software. Most computer users still do not know that potentially unwanted programs spread via software bundling method, which means they can be installed alongside other free applications. Luckily, it is not that complicated to prevent this from happening in the future. In fact, to avoid installing such programs, you just need to adjust installation settings a little whenever you install a new program on your PC. Switch the settings option from Default/Standard/Recommended to Advanced/Custom mode and then deselect all suggestions to install optional applications, add browser toolbars, change homepage settings, etc. We highly recommend deselecting all additional items as they typically appear to be entirely useless. Here, look for MyDrivingTab or any other recently installed suspicious programs. Wait until you see Applications folder and look for MyDrivingTab or any other suspicious programs on it. Now right click on every of such entries and select Move to Trash. When in the new window, check Delete personal settings and select Reset again to complete MyDrivingTab removal. Once these steps are finished, MyDrivingTab should be removed from your Microsoft Edge browser. Here, select MyDrivingTab and other questionable plugins. Click Remove to delete these entries. Now you will see Reset Firefox to its default state message with Reset Firefox button. Click this button for several times and complete MyDrivingTab removal. Here, select MyDrivingTab and other malicious plugins and select trash icon to delete these entries. Click Reset to confirm this action and complete MyDrivingTab removal. Here, select Extensions and look for MyDrivingTab or other suspicious entries. Click on the Uninstall button to get rid each of them. Here, look at the Homepage field. If it was altered by MyDrivingTab, remove unwanted link and enter the one that you want to use for your searches. Remember to include the "http://" before typing in the address of the page. Now you will see a detailed dialog window filled with reset options. All of those options are usually checked, but you can specify which of them you want to reset. Click the Reset button to complete MyDrivingTab removal process. This entry was posted on 2016-07-26 at 07:28 and is filed under Stealing programs, Viruses. You can quickly scan the QR code with your mobile device and have MyDrivingTab manual removal instructions right in your pocket. 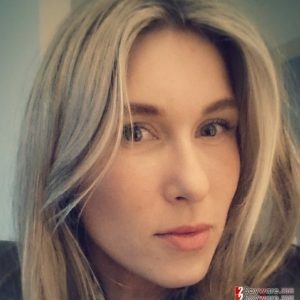 How did you remove MyDrivingTab?